Good morning! I am in an exceptionally good mood today because it is a rainy morning in Phoenix, which is a very rare thing. 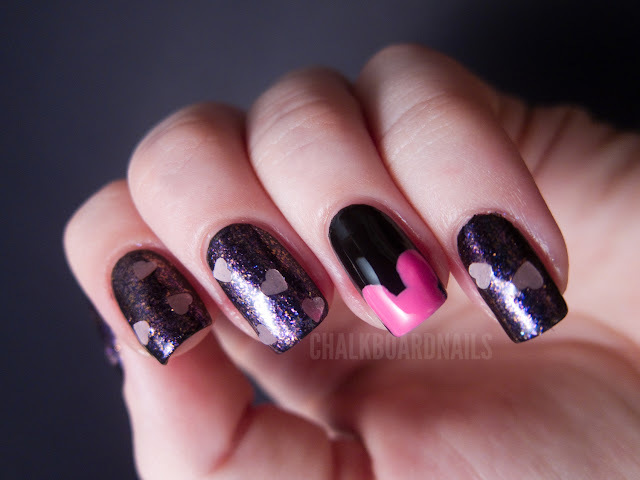 Today's post is another look featuring the colors from the OPI Vintage Minnie Mouse collection! I call this one "Minnie's Night Out," because it's a bit sexier instead of cute and playful. So far, you guys have only seen one of the Minnie colors from me. Today's mani introduces a second, OPI Nothin' Mousie 'Bout It. You will see this again in my final Minnie look, in its more natural state, but for today's manicure, I've layered it over OPI Black Onyx. 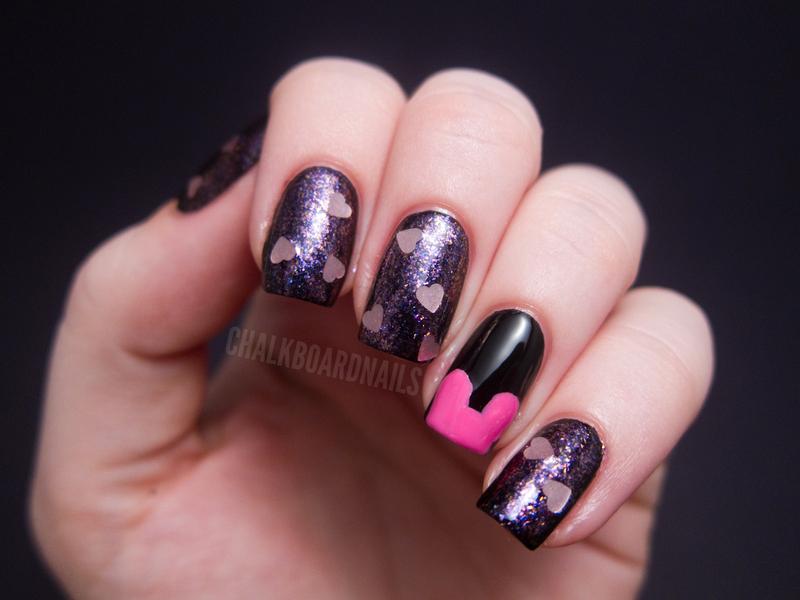 On its own, NMBI is a pink jelly base filled with colored glass fleck pieces and large confetti style heart glitters. Over black, the flecks really stand out in a dramatic way! I actually prefer it over black, personally. I think it has a much greater wow factor. Of course, the confetti pieces can be difficult to use, but that is no different than any other polish with the same type of shape glitter. I actually was surprised with the frequency that the hearts were coming out on my brushes; it's just the placement that takes a little bit more attention. For the accent nail, I freehanded a set of mouse ears on in white. I then painted over it with OPI If You Moust, You Moust, which you may remember from the last Minnie Mouse look that I did. The white base helps to make the color stand out against the black better. I hope you guys have enjoyed this manicure! I have one Minnie-mani left, which is a "classic Minnie" look. OPI's Vintage Minnie Mouse collection will be available starting in June. It will retail for $8.50 per bottle. The product(s) in this post were provided to me by the manufacturer or their PR. I live in Phoenix too and this rainy morning is awesome! I love it, it's so stunning! So pretty! I love it over the black, it stands out so much more than over pink. lurve. Minnie would rock this on a night out! This is so cute! I cannot wait to get my hands on the Minnie collection. This is so cute!! I actually have the same Nothin' Mousie 'Bout It, but it's from Face Shop (a Korean brand), a doppelganger? I'm new to reading your blog, but I check it every day now! Your mani's are so cute and this one is certainly no exception! I was just wondering how Nothin' Mousie 'Bout It would look on black, and than I read this post! It looks fantastic over black! Thanks for the cute Minnie mani!